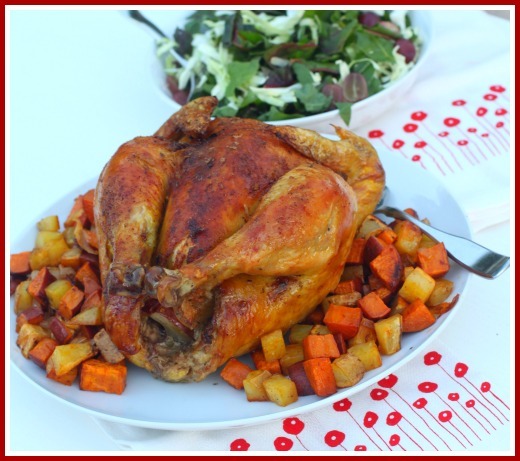 Do you wince at the thought of roasting a whole chicken or turkey? Does it seem a bit overwhelming to attempt? I swear I used to feel this way too. And honestly? I am not even sure why. It just seemed like it was such a grown-up thing to do. And really, even nearing 40 now, I still do not feel like a grown-up yet. I watched my mother roast literally hundreds of birds during my childhood. Seriously…that number could even be closer to thousands if I really calculated it out. I saw firsthand how she would throw some seasonings together, rub that chicken or turkey up real good, then toss it in a roasting pan and into the oven. She made it look so simple…she even swore it was. When I first started cooking for my own family, for some reason I just could not bring myself to attempt roasting a chicken or turkey by myself with all of those dangling limbs, and bags of giblets, and that awkward body cavity. It really is as easy as Mom made it look! Promise. I finally got over my fear years ago, and now it is a staple meal in our house. It can literally take you ten minutes to prep and get into the oven. Throw in some diced potatoes and veggies around it about halfway through cooking. And BAM…a full meal is cooking away in your oven-perfect for a Sunday meal with guests or a busy weeknight. 1. During the months leading up to the holidays, you can save all of those yummy chicken/turkey drippings to add to your Thanksgiving turkey gravy…and I assure you that your gravy (or your guests) will NOT know (or care) if some of those drippings came from a turkey, a chicken, or both! This is a perk in my house for sure, where I swear my family thinks there is going to be a national gravy shortage. They hoard it like they are in survival mode. Thus…I say the more drippings the better. 2. You get a beautiful carcass to save for use in none other than a beautiful pot of nourishing bone broth. If you know one thing about me, it probably is how much I love my Bone Broth. Once you make your own, you will be hooked too. There are so many health benefits to Bone Broth. You can then use it in everything from your cooking liquid in rice, as the broth in soups, as the liquid in sauces….and of course, in your gravy! 3. If your chicken or turkey is on the larger size, you will likely even have leftovers that you can use in a simple meal the next night. That is a two-for-one meal in my opinion. A perfect way to use up your leftovers would be in these super simple Gluten-free Dairy-free Mexican Pizzas that I have posted over at the Balanced Platter today- a healthy and quick meal that will get you in and out of the kitchen fast on those busy weeknights. 4. You will feel really grown up once you accomplish your first bird. And you will be really amazed at your new kitchen prowess! 1. Arrange a rack in the middle of the oven, and preheat to 400 degrees F.
2. 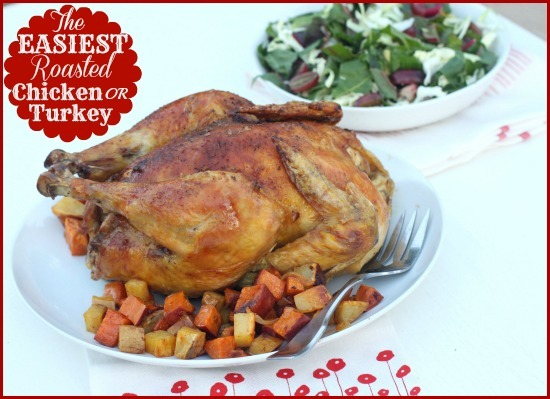 Place Chicken in a large roasting pan or baking dish. In small bowl, mix together Olive Oil or Butter, half of the Garlic Salt, and mashed Garlic. Rub mixture generously over entire Chicken, rub some of the mixture under the skin on the breast. Then season the entire chicken generously with half of the Sea Salt and half of the Smoked Paprika. Tie legs of chicken together. 3. Place pan in the oven and roast at 400 degrees F for 30 minutes. 4. Then reduce oven temperature to 375 degrees. Pull roasting pan out and scatter Onions, Potatoes, and Carrots around the chicken and season with remaining Garlic Salt, Sea Salt, and Smoked Paprika. Roast for 30 minutes more. Then cover chicken loosely with foil to prevent overbrowning and cook for 25-30 minutes more, or until chicken is cooked through. 5. Let chicken sit for 15 minutes before carving. Serve with the vegetables. *Save remaining chicken/turkey for leftovers, such as these Gluten-free, Dairy-free Mexican Pizzas, for the next night. *And, of course, save your carcass to make your own Simple Nourishing Bone Broth. Your chicken looks awesome! My mom roasted many a chicken, too, and it’s as simple as you say. That’s such a flavorful recipe with those veggies and seasonings — I’m sure I’d love it, and with a little less paprika, my husband will, too. Fabulous looking chicken my friend! I used to make a roast chicken every Sunday night. It was simple but special at the same time. Kim, you always make every recipe look so easy!! Are you sure we’re not related? I just made this complete with the bone broth. It’s a great way to save money. Oh and my local WF now carries chicken feet! I can’t wait to give that a try. I love the smoked paprika too. Great touch. Hi HEather, this is a very forgiving recipe. I use sweet potatoes all of the time instead of regular potatoes. And you can totally leave out the garlic and sub the paprika for any of your other favorite spices. This is one recipe you can definitely play with and adjust to your tastes and food sensitivities. Enjoy! Perfect timing! I have a chicken in my fridge waiting to be cooked today with NO inspiration happening! Oddly enough, I have all ingredients on hand too. Guess what we’ll eat for dinner tonight?